RingCentral, which focuses on providing VoIP services to businesses, today announced the beta launch of its WebRTC-based API and developer kit for developers. 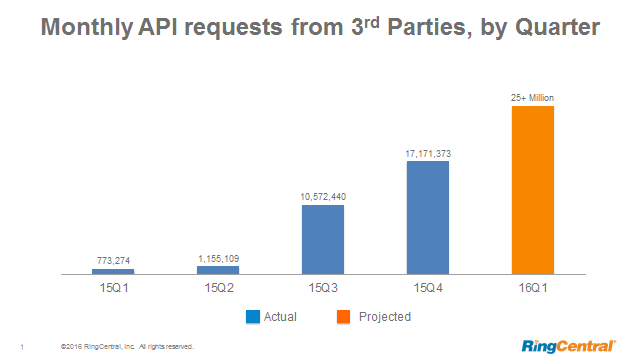 RingCentral’s one-year-old Connect Platform, which helps developers integrate business communications (including voice, text and — for the older generation — fax) into their business processes, already handles about one million API calls every day, and it saw a 50 percent increase in API requests from third-party developers in the last quarter of 2015. Now, the company has decided to also open up a WebRTC-based API, as well. WebRTC, which is now built into most modern browsers, allows for plugin-free voice, video and text chat right from the browser, but because of some inherent limitations to the protocol, you still typically need a service that can manage connections for you. He also noted that even though users have adopted RingCentral on the desktop and mobile, “we often see demand for an ‘installation-free’ communication experience.” Because most of the company’s users already use web-based applications to manage their businesses, being able to offer them a WebRTC-based solution is a natural step for the company. Access to the API will be included in RingCentral’s Office accounts and users who make calls over it will incur the same cost as for calls placed through the company’s other services. You can now apply for access to the API here.